We're a member driven, self-help sailing club, dedicated to the enjoyment of sailing as a recreation, and advancement of the sport as a competitive activity. We're a club for real sailors: we only sail boats where if you make a mistake, you end up swimming. Excellent accommodation is available nearby, there's a Tim Hortons a 10 minute walk away, and superb vantage points of the Lake and downtown Toronto are just a few minutes walk. And if you're from outside Toronto and really want to sell a non nautical spouse on the idea, we are a 20 minute drive from downtown Toronto shopping. The regatta will be governed by the rules as deﬁned in The Racing Rules of Sailing 2017-2020. Racing rule changes will appear in full in the Sailing Instructions which will be issued prior to the ﬁrst Skipper's Meeting. A personal flotation device or life jacket must be worn at all times. Wet suits or dry suits are not adequate personal buoyancy. Failure to comply with this Rule will be grounds for competitor disqualification. Entry fee is $75 for double handed and $60 for single handed. The entry fee includes Saturday night dinner for skipper and crew (additional dinner tickets are $15 each). Note: Participants are requested to supply their own lunches. A signed Waiver Form must also be submitted prior to the close of registration. Saturday July 27 (11am ﬁrst start], no races to start after 4:00 pm. Sunday July 28 (10am start), no races to start after 2:30 pm. Please see attached schedule of events for more details. The Low Point scoring system of Appendix A will apply. One race completed will constitute a series if no further races can be completed. 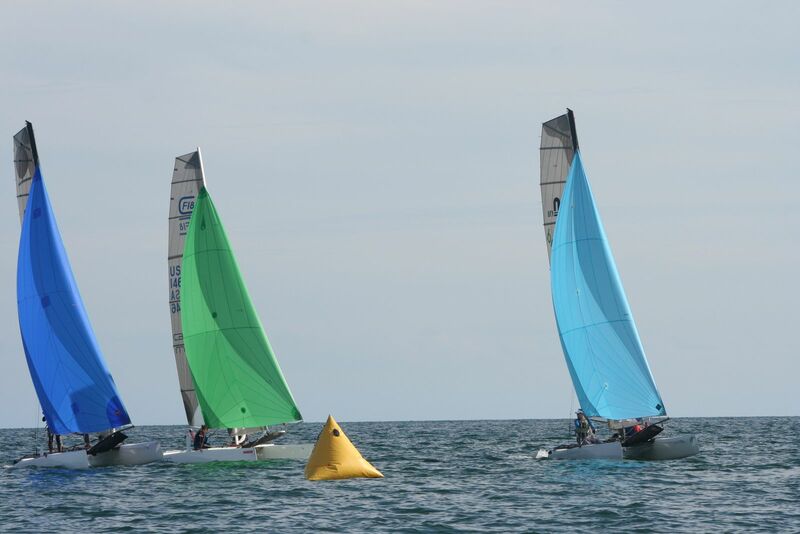 When fewer than 5 races have been completed, a boat's series score will be the total of her race scores. When 5 or more races have been completed, a boat's series score will be the total of her race scores excluding her worst score. Awards for 1st through 3rd in the regatta. Although the weather ashore is usually warm, the waters of Lake Ontario can, at any time of year, be very cold (< 10C/50F) during and after a stiff off-shore breeze. Competitors are urged to bring clothing appropriate to sailing in these conditions. Participating boat shall be insured with valid third-party liability insurance with a minimum cover of $1,000,000 per incident or the equivalent. Competitors participate in the regatta entirely at their own risk. See RRS 4, Decision to Race. The organizing authority, volunteers and/or the Mississauga Sailing Club will not accept any liability for material damage or personal injury or death sustained in conjunction with or prior to, during, or after the regatta. Mississauga Sailing Club is located in Lakefront Promenade Park in Mississauga Ontario. Take the Cawthra Road (south) exit from the QEW highway. Travel south on Cawthra and make a left turn on to Lakeshore Road E. Travel east on Lakeshore Road and make a right turn onto Lakefront Promenade. Signs for MSC will be on your right. Watch out for the SPEED BUMPS. Any amendments to this notice will be posted on the official notice board at MSC prior to 0930 hours on Saturday July 27, 2019.